Insulation is an essential component of window treatments, whether during the summer or winter. Insulation helps reduce air conditioning costs during the hot summer months and keeps the house cooler. During winter, it helps regulate air and humidity within the household, keeping the environment warm and crisp. While many people would have heard about cellular shades or roman shades and the incredible insulation abilities they offer, not many are aware of just how amazing the benefits the later of the two has to offer for the home or office. The great thing about cellular shades is that they keep the harmful UV rays out of our living spaces by not allowing it to pass through. If made of sheer fabric, they can also allow some light to filter through. Nothing like saving money on energy via two separate flanks. 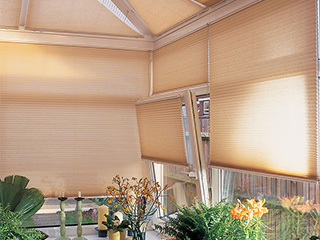 Cellular shades also come with light blocking abilities when made from more opaque fabric or materials. That means they can block more than UV rays, and will also minimize visibility into your property. Opaque cellular shades are ideal for bedrooms and really any part of your home or business you want to be able to achieve complete privacy in. As mentioned before, the thermal efficiency of cellular shades is probably their biggest strengths. With proper insulation technology, you can be sure that your home will have an easier time staying warm during winter and cool for the summer. These insulating coverings will make it so your HVAC unit won't have to work as hard to achieve and maintain your desired indoor temperature. Honeycomb shades have superior noise reduction abilities, and some can even reduce up to 45% of outside noise. They can lower the sound of roadworks, passing traffic, and passing pedestrians. Noise pollution is a real thing, and it can seriously spoil your indoor environment if it isn't mitigated in some way. Did you know that cellular shades create air pockets that keep heat transfer to a minimum? Their honeycomb-like pattern consists of unique shapes that have excellent insulation properties that help you save money on energy bills by making it a bit easier for your AC unit to keep the room nice and cool, or warm and cozy, depending on the time of year. Brands like Hunter Douglas, Hampton Bay, and Levolor all carry these unique shades, that are excellent choices as window coverings, especially for room darkening or light filtering. When you are looking for cellular shades, look for those with d-shaped cells as they are designed to hold the honeycomb style pattern better. Essentially, the more concentrated the number of cells, the better insulation it will provide for your homes or offices. Another one of the benefits that cellular shades have to offer is a beautiful design. Their unique pocket pattern makes them an eye-catching addition that can certainly contribute to the rest of the room's decor. You can get these great window decorations in any fabric choices from point bond to spun lace. They can offer you elegance, utility and style, all rolled into one. For more information on the custom made cellular shade option available to you, get in touch with Newport Beach Blinds & Shades and schedule a free consultation.